In this oral history website Brookyn College students narrate two historical episodes: their experiences of working on farms during World War II, and the events surrounding the suspension of the Vanguard, the student newspaper in a postwar McCarthy era climate. The edited testimony is accompanied by audio excerpts. These case studies add another dimension to our understanding of life on the American homefront during World War II and the domestic Cold War. In this website you will also find resources for students and teachers of oral history. "Doing Oral History" is an essay that draws on the website's interviews to illustrate the process of conducting and interpreting oral histories. The essay, in the background section, also outlines the website's central historical themes. In the "Teaching" section users wil find primary documents from the narrated historical episodes, two sample unedited oral history transcripts, the interview question guides, a bibliography/webography, a timeline, and an "Oral History Theory and Practice" syllabus. In the first episode, the historical narrators describe participating in Brooklyn College's Farm Labor Project. 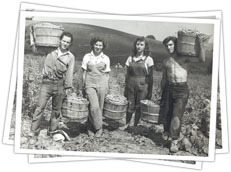 These students, children of immigrants, chose to support the war effort on the homefront by working on farms in Upstate New York picking peas and beans during the summers of 1942, '43, and '44. "Feed a Fighter in '44" was one of the Project's slogans. In their accounts, the students describe the hard work of farming; encounters with America's migrant farm labor;the experience of being the "other" in small homogenous farming communities; and the adventure of living away from home, immigrant families, and urban life for the first time. In the second episode, the students chronicle their experiences with the Vanguard, the college newspaper, during a period in which civil liberties were threatened on college campuses around the country. These student journalists, some of whom were World War II veterans, were involved with the Vanguard when President Harry Gideonse of Brooklyn College shut it down and suspended several of its writers and editors. The closure was the culmination of an ongoing struggle over the newspaper's content. The Vanguard journalists, an eclectic group of civil libertarians with a range of political orientations, asserted that the president closed the paper in order to squelch student opinions that did not conform to those of the administration. Gideonse, they charged, had brought the Cold War to the college. This project is a collaborative effort by Adina Back, the City University of New York's Brooklyn College, John Jay College, and The Center for Media and Learning/American Social History Project at the Graduate Center, CUNY. Funded by the Research Foundation of the City University of New York, CUNY Collaborative Incentive Grant.